Fiddle-Dee-Dee Designs: Everyday Storyteller Idea Book Blog Hop! 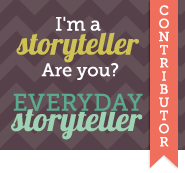 Welcome to Everyday Storyteller Idea Book Blog Hop! 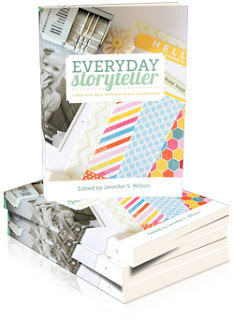 I am honored to be included along with 32 other inspiring contributors from across the scrapbooking industry who came together to share real world, practical scrapbooking ideas in an essential idea book called Everyday Storyteller. It's so exciting that this is happening at one of my favorite times of year as well ~ National Scrapbooking Day! There are crops, challenges, chats, games, giveaways and loads of sales this weekend. Without a clear plan of action, you could really miss out on activities as well as sales. Take a few minutes now to peruse Facebook and site forums to get advance information about sales and events for the weekend. Make a list of the things that you know that you don't want to miss. It's so easy to get distracted, so if you have a list to ground you, you will find that you have time to shop, as well as time to jump in and actually scrap some pages with your new supplies! While you are making your list, be sure to clear your calendar for Friday night! You are invited to the Everyday Storyteller Launch Party Friday, May 4 at 8:30 pm CDT. Click on the image below to go straight to the site to sign up to receive your own invitation to the launch party. There will be over $700 in prizes given out at the launch party, so don't miss out! Speaking of prizes, I have one copy of the book to give away! Simply leave a comment on this blog post by May 1, 2012, at 11:59 pm CDT (make sure that there is some identifying information so I can locate you via blog, email address or Facebook). I'll randomly select a winner from the comment entries to receive a copy of Everyday Storyteller! Thank you so much for coming by to visit me! I've included a list of all the contributors participating in the blog hop. Be sure to stop by their blogs for additional tips and information (and pssst, prizes). Thank you so much for this post. I want to let you know that I posted a link to your blog in CBH Digital Scrapbooking Freebies (please, notice the new url for my blog), under the Page 8 post on May. 01, 2012. Thanks again. This book sounds wonderful! Thanks for the chance to win. oh! Thank you for the chance to win!! Love the chance to win :D Thank you!! thanks for the chance Cheryl...can't wait to see the book! I bet it's a very good book ! :) Ebook version available ? Would love a copy of the book. Thanks for the chance to win! Looks like a really great book, would love to win it :) Thanks for the chance! That looks like a great book! Thanks for the chance! Looks like a great book, I need all the help I can get! I'm sooooo looking forward to the launch! Thanks for the chance to win this fantastic book! This is so exciting Cheryl - congrats on getting published. And thanks for a chance to win! Would love to get this book! Can't wait!!! This looks like an awesome book, and I am definitely going to try to make the chat Friday night! livingoutloud77@gmail.com. I've been away, because I recently moved. Hopefully this will give me the incentive I need to dig into my digi-scrapping again. I miss it! Like I have sayd on the other blogs and sites, this book is a real must have, it all sounds so awesome and fantastic!! Thanks for a chance Cheryl!! Thanks for the chance Cheryl!! I am very intrigued by this book! I am looking forward to it's release! Excited for this, thank you for the opportunity!! rkdn@shaw.ca. The book sounds wonderful! Thanks for the chance to win! Awesome Cheryl! So exciting! thanks for the chance to win the awesome book! This looks like a very cool book! I'm looking so forward to the launch of this fabulous sounding e-book. Thanks for the chance to win. What a great giveaway! Have my fingers crossed! What an awesome giveaway! Keeping my fingers crossed! Thanks for the chance to win, Cheryl! Looking so frward to this book. Thanks for the chance to win a copy. thanks so much for the opportunity to win a copy of what I know will be an incredible book! This looks like a "must have" book for all scrapbook folks. Thanks for offering a copy via a unique blog hop. I am so excited for the release of this book. Thanks for a chance to win! I always can use some help with Journaling and telling our stories! Great Giveaaway! Thanks for the opportunity. This looks like an awesome book. I would so love to have this book! Thanks for the chance to win. Sounds sounds like a lot of fun going on this weekend. I can't wait to see the book! Thanks for the chance to win it . This book sounds so inspiring -just what I need. I'd love to win! Thanks for an opportunity to win this book. I really like the template for your other blog - you gotta love the glitter. So excited to see this book! Thanks for the chance to win! Soooo excited about this book! Thanks for the chance to win!!! Looks like a great book, can't wait to see it! PS: I saw your cute Kay Miller page on your last blog, adorable! So fun to recognize the names of so many crafty and talented ladies! This looks awesome. The list of contributors is amazing. Can't wait for the party. Thanks for the chance to win. The book looks great! thanks so much for the chance! Ooooh the chance to win a book that features you in it... would be stunningly awesome! This books looks like an great resource to have. Can't wait to get it, hoping for a win too :) Thanks. What a cool idea...looking forward to hearing more about it all! I'd like to throw my name in the hat--sounds like a wonderful resource. Thank you, Cheryl, for this chance...Thank you also for helping me scrap my stories with your awesome templates! Would love to win! Congratulations on contributing to a wonderful resource! Thanks so much for giving one of us the chance to win a copy of this book! It looks amazing! So excited for this book. Thanks for the chance to win. I will like to win! Thank you! can't wait to see the book!!! Congratulations on being included in the book. I'd love to win a copy. This book sounds just wonderful. Thanks for the chance to win! Thank you for the tip. I am new to digi and disappointed that plans for this weekend will prevent me from participating in all things iNSD. However, I'm going to make my wishlists and find a few things that I would like to do that MIGHT fit in with graduation activities. Then if I get a few minutes at my computer, I'll know where to start! Thanks! Looks like tons of inspirations! Thanks for the chance! The sneak previews of this book have been fascinating…I would love to have my very own copy!! Very excited about this book! Thanks for the chance to win! Looks like a great book! Thanks for the chance to win! So exciting! thanks for the chance to win! How awesome!!!!!! I definitely need this!! Wow, thanks for sharing about these opportunities and for the chance to win! Cheryle this is so awesome! You are famous...lol. Congratulations. Well deserved. Thanks for sharing this with us. Wow, this is really exciting! Thanks for the chance to win! Commenting is now closed! Stay tuned to find out who the winner is!